It turns out that when the Super Bowl comes to town, the NFL completely takes over... everything. 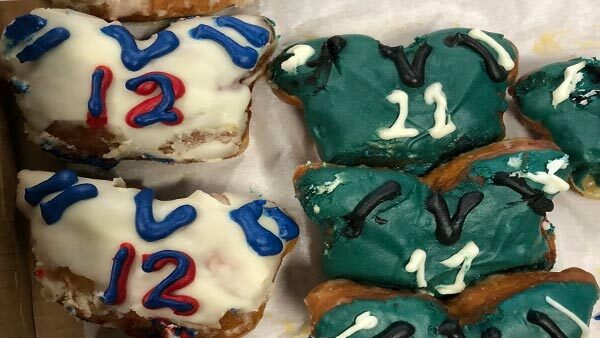 Here in the Twin Cities this week, not only are signs up pretty much everywhere you look advertising the big game this coming Sunday night, but team logos are also splashed all over hats, T-shirts, buses and even donuts. These delicious options were presented to reporters in the media lounge Monday morning. I tried both. For what it's worth, the one on the left tasted rather stale. But the one on the right was as sweet as victory! I'll consider that a very good sign.